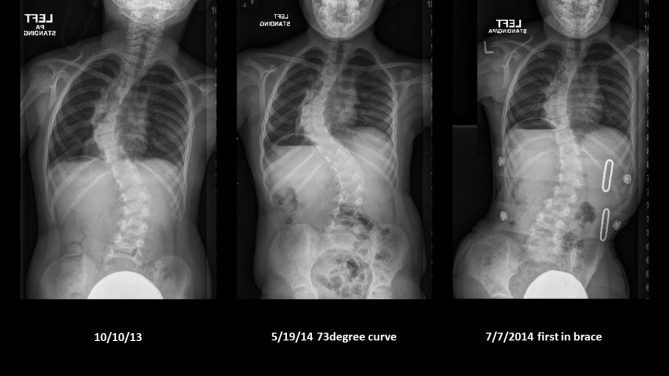 Starla M first came to our office at the age of 5 as a second opinion for Early Onset Scoliosis. Starla’s aunt first noted asymmetries. 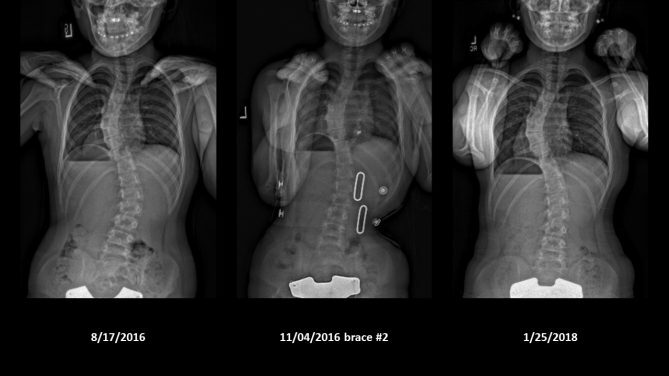 Upon X-Ray, Starla had severe thoracic and lumbar curves of 55 and 47 degrees. With severe curves, we discussed bracing, casting, and surgical interventions. Her parents wanted to postpone surgery as long as possible, as a fusion could hinder lung growth. We developed a plan involving a series of three MEHTA casts followed by a custom Rigo-Cheneau brace. Starla also began working with Schroth physical therapy. Unfortunately, the casts were not able to control Starla’s curve progression. Starla’s curves measured 73 and 47 degrees when she started working with our Orthotist John Tunney. Starla was a super star with bracing close to 20 hours per day and following a daily Schroth routine. After a year, Starla’s curves were 52 and 45 degrees. Starla recently visited our office, now 9 years old and has outgrown her second brace. Recent x-rays showed her curves measuring 40 and 27 degrees. Follow this link to hear more about her story.